The nine Caribbean and African American artists selected and commissioned to create new performances for EN MAS’: Carnival and Performance Art of the Caribbean tackled Carnival, Junkanoo, and second lines—African diasporic street masquerading and parading practices—directly or tangentially, critically or subversively. They charted the course of the 2014 Caribbean Carnival season, calling at Santiago de los Treinta Caballeros, Fort-de-France, Port of Spain, Kingston, New Orleans, London, New York, and Nassau, drafting a new cartography of performance practices in the process. The artists chosen for EN MAS’ have had a long history of engagement with Carnival and carnivalesque masquerading practices. They come from radically distinct yet undeniably linked historical backgrounds and artistic formations that do not preclude yet cannot be subsumed under the canonical histories of artistic performance, which are aligned with narrow Western modernist narratives long debunked by black Atlantic countercultural networks. The timeline I edited in this catalogue shows how, starting in the 1930s, such developments evolved from the spheres of dance and theater to the visual and performance arts of the 1980s—and how the artistic projects in EN MAS’ are the latest outcome of this process. From its modern development in the Americas to current artistic and curatorial experiments in the Caribbean, Carnival provides a critical anchor for the rearticulation of contemporary discourses and practices around performance art and exhibition making. In this essay, I first challenge Carnival theory by suggesting that an examination of the word Carnival itself is in order, considering how radically Carnival metamorphosed in the aftermath of the Middle Passage—possibly to the point of misrecognition. 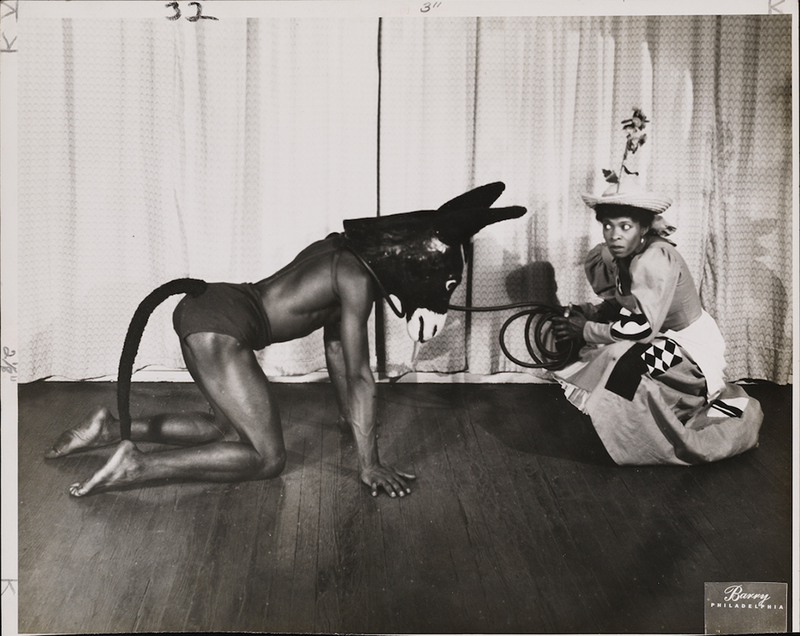 I then open up genealogical paths linking Carnival to the development of performance in the Caribbean. Finally, I bring Carnival back into the exhibitionary fold by showing how it belonged all along, if as a countermodel. While these notions have done much to further Carnival theory after Bakhtin, I ask fundamental questions and propose foundational articulations to theorize the development of modern Carnival in the Americas. Is Carnival but an ill-fitted Old World costume for an unfathomable New World custom? How did Carnival, the word and the practice, come to subsume or suppress Native American, European, and African memories, histories, and cultures? What became of Carnival during the crossing of the Middle Passage and following the experience of slavery and colonization in the Americas? Did American slavery and colonization substitute for European and African servitude and feudalism? How is carnival theory affected by the figure of the slave, as commodity of flesh and instrument of labor, in the circum-Atlantic drama of modernity’s counterculture?How, also, to reconcile the economic ramifications of the word performance within the productivist context of slavery, indentured servitude, and other forms of coerced labor? As circum-Atlantic Carnival activated anew the meaning of flesh consumption as sweat meat and slave body, we cannot carry on conceptualizing Carnival as a celebration of the flesh within a circum-Atlantic economy of human flesh. Carnival in the Americas, then, is a misnomer. Such is my preliminary conclusion to my investigative premise into the role, meaning, and function of Carnival in the art of the Caribbean today and contemporary African diasporic aesthetic practices in general. My continuing use of the word Carnival in this essay is informed by these critical reflections. Mas’ is better known through, but by no means exclusive to, the Trinidadian vernacular. Indeed, Carnival found a linguistic alternative and a notable semantic reinforcement of the notion of masque and masquerade within vernacular languages across the Caribbean in mas’: in French Creole, mas or mass is “masque,” as used in Guadeloupe and Martinique in mas a congo, mas a Saint Jean, and mas a l’enmô; and in the Trinidadian colloquium mas’, the preferred term for Carnival in the English-speaking Caribbean, where to participate in Carnival is “to play mas’.” At any rate, the African diasporic imprint seems to press upon precisely the space created by the distance and distinction between Carnival and masquerade. The predominance of mas’ within wider critical discourses and practices also prompts inquiries about the popularity of the Trinidad Carnival model, at home in the Caribbean and abroad in the diaspora. This model has evolved from ragtag nocturnal processions to the sound of tamboo bamboo, a warring turf for competing steel bands, regal parades of historical and mythological themes, skimpy displays of Soca-powered bikini-and-beads mas’ bands. Nowadays, the middle classes form the masquerades. Made-in-China suppliers provision them with bikinis, beads, and feathers. Mas’ men and Junkanoo masters, carnavaliers and other carnival makers handle glue and staple guns, mold plastic and form-fit backpacks. Contemporary artists desert mas’ camps and shacks, migrate to North America, the United Kingdom, or Japan, or suffer disaffection on the home front if showing too much innovation. Audiences huddle up behind television screens rather than hustle in the streets. Public space is as privatized as it is carnivalized; bodies are branded by advertisement on shirts worn, flags held, rags waved. As EN MAS’ followed the carnival season, I called at every one of its ports. In the following section, I recount each performance I witnessed, photographed, helped produce, or participated in by relying upon three temporal modes and attendant archival stages: my memory of the lived experiences, the mnemonic support of documentation provided by the audiovisual material commissioned alongside the performances as well as my own documentation of the performances, and the projection of the exhibition. I do not, however, do so in the chronological and geographical order restituted in the artists’ monograph section of the catalogue. Breaking away from the linearity established by the month-to-month progression of the project and presupposed by the processional medium developed in public ceremonial culture and employed by some of the artists in EN MAS’, I have found myself treading on intersectionality and circularity instead, for the latter connects with deeper seasonal patterns, predicated upon lunar cycles, themselves the determiners of oceanic rhythms, of which the African diaspora is the ever-flowing-and-ebbing becoming. Lorraine O’Grady has built a conceptual practice in which Carnival might seem an anomaly. Yet as our two-year conversation around her Beckettian search for a carnival costume revealed, as Looking for a Headdress will further suggest, and as the resulting performance of this late-day Mlle Bourgeoise Noire avatar will later manifest, O’Grady has had a lifelong engagement with Carnival. To the contemporary art world, O’Grady’s early eighties performance Art Is…, staged in Harlem as part of the African American Day Parade, provides the prime and sole such indication of her carnival interest, if in a somewhat roundabout way, as she avoided going the route of the West Indian American Day Carnival Parade. As she recalls: “I wasn’t from Harlem, so half the time I didn’t know what I was looking at. But I had deliberately not put the float into the West Indian Day parade in Brooklyn, where I would have felt at home, because I didn’t think avant-garde art could compete with real carnival art. I felt it might do better with the umpah-umpah of marching bands and the beer company floats.”23 Art Is…featured white leotard–clad black dancers framing parade goers with several handheld picture-size gilded frames and one monumental frame on a truck-powered float, producing a performance of seeing and being seen that turned the classical Western pictorial tradition inside out. These two conversation fragments—about, on the one hand, Caribbean Carnival, an early pan-Caribbean diasporic artistic gathering around Carnival, and, on the other hand, contemporary Carnivals from Brazil, the Caribbean, and their diasporas—are a measure of the distance between being of and/or being from the Caribbean. The dispositive of distancing created by O’Grady in Looking for a Headdress—a kind of talking-head reaction video in which she and Gosine are briefly seen in slow motion, watching and discussing and seemingly spoofing worldwide carnival footage—brings no closure to this state of diasporic of-and/or-from-ness. As if obfuscating, their image was to memory what forgetting is to performance: a prerequisite for surrogation toward the emergence of the artistic process. O’Grady’s Carnival, Caribbean, art, and performance experience situate her at a crossroads from which to follow the various paths forged ahead by the artists in EN MAS’. By shooting the West Indian American Day Carnival Parade on Labor Day and hosting their conversations during the summer (when Gosine also attended Toronto’s Caribana), O’Grady and Gosine did inscribe Looking for a Headdress within the chronology of the Caribbean Carnival season. O’Grady also excised Looking for a Headdress from Carnival altogether, navigating in and out of a real and imaginary inspirational Carnival space. So did EN MAS’ artists circumvent or reinvent such spatial and temporal frames, creating projects concurrent with, proximate to, or overlapping with Carnival—but never easily assimilable into it. Veteran mas’ practitioner Marlon Griffith and mas’ newcomer Ebony Patterson chose to jump right into the fray.27 Griffith took to the streets of Port of Spain in the evening of the last and most symbolic day of Carnival, Fat Tuesday (or Carnival Tuesday, as it is simply called in Trinidad), while Patterson launched her procession in uptown Kingston during the daytime on the last Sunday of Jamaica’s Trinidad-style Carnival after last-minute suspense over the status of her parade permit.28 The ways they positioned their performances—the former a nocturnal procession outside of the official “parade of the bands,” the latter a diurnal parade within the sanctioned Carnival route—played decisive roles in the different outcomes they garnered. “This is obeah!” onlookers exclaimed within minutes of spotting a small crowd of masqueraders moving through a halo of light shone from one of their own. Standing on top of a metallic structure, precariously wheeled out of Belmont toward the Savannah into the open night, the female masquerader from whose helmet the light beamed was pointing her index finger in various directions. At her feet, a man with high heels on his hands wore a rounded visor onto which a video of grinding human teeth played. A dozen masqueraders, like them clad in black short-sleeve samurai-like calicos and knee-length lap-skirts, but sporting self-styled hats and face-covering fishnets, pushed or else walked them along. Contrasting with their dark do-up, fast-fading white powder in lattice-like motifs appliquéd on the skin of their chests could be glimpsed beneath their open vests. Trailing the procession was a sound system emitting a barely audible, ghastly heartbeat. Marlon Griffith’s POSITIONS + POWER seemed an unprepossessing procession by mainstream Trinidad Carnival standards. As it maneuvered traffic, potholes, and policemen and came across strings of bikini-and-beads masqueraders on Ariapita Avenue before ending in a cloud of white powder in front of Alice Yard, the contrast between Griffith’s performance, Carnival, and contemporary art in Trinidad registered starkly. Right from the start, upon leaving his makeshift mas’ camp at Granderson Lab in his home neighborhood, Griffith, walking backward with his hand outstretched to provide traffic directions, faced the arduous task of motivating his troupes, prone to much the same silent questionings that had his ad hoc audience guessing out loud. The stone-faced mas’ players walked in a solemn funeral formation as if mourning the loss of their autonomy due to their codependent relationship with the towering figure—it needed them to move, they needed it to see. 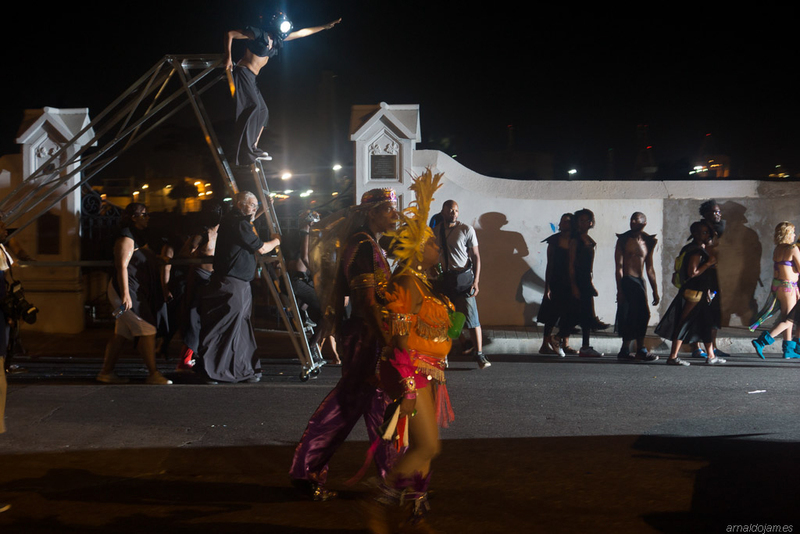 The OVERSEER, the female masquerader on top of the surveillance tower, and DOBERMAN, a dog impersonator—her watchdog—took on the Trinidad Carnival tradition of “individuals,” special character designs above the identical outfits of the foot soldiers but under the prestigious King and Queen costumes; they were discursive visual clues linking colonial and contemporary modes of surveillance. Policemen, having replaced plantation overseers and dogs, remained. Based in Nagoya, Japan, since 2009, Griffith has made a name for himself as a contemporary artist in the international art world with mas’-inspired processional performances, as well as in the carnival world as a sought-after mas’ man. Why, then, was this post-Minshall roadwork prompting so much guesswork from his participants as well as the general public? Having stepped into the group of Minshallites, Alice Yard followers, and devoted students as a half-costumed masquerader myself, I pondered the generational divide among us. Was playing mas’ even available as a performance register among the twenty- or even thirty-somethings more accustomed to wining in made-in-China spandex outfits in all-inclusive mega mas’ bands than portraying Dame Lorraine, speechifying in the Midnight Robber and Pierrot Grenade tradition, impersonating a Fancy Sailor, or sewing scales on a Dragon costume come Christmas-end? Had the Port of Spain public forgotten the likewise haunting visions of Peter Minshall’s “Mancrab” (1983)? Was the critical evocation of lower-class status implied by the sweat-prevention practice of chest powdering, sometimes also associated with prostitution, too faint or too coarse, despite having been beautified through ornate motifs? Was the plantation metaphor too abstract—or had the colonial era become too remote for the public to care to remember it, less it failed to recognize its present-day iteration? Ebony Patterson picked up where Griffith left off, following in the mourning mode with a funeral procession of fancy coffins, emerging from streams of bikini seamlessness and soca sameness carried over from Port of Spain to Kingston. 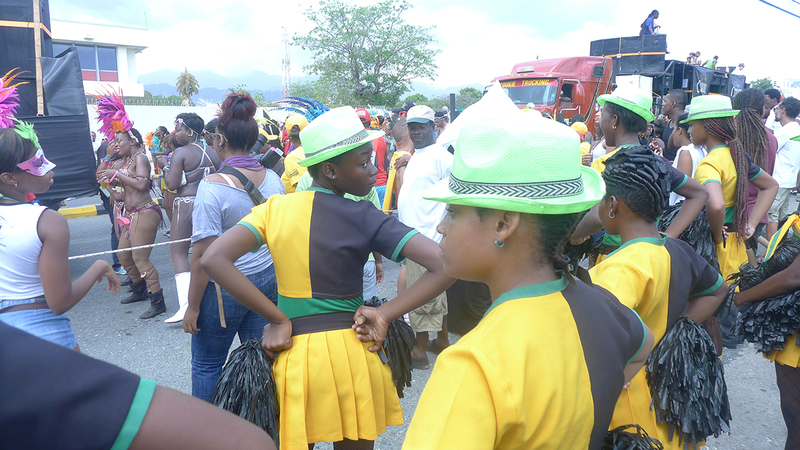 Teenage marching-band players with matching outfits in the national colors waited out Jamaica’s Trinidad-style Carnival crowds while a mix of students and supporters in everyday clothes waited to pick up their load as part of Patterson’s Invisible Presence: Bling Memories. Once the last sound of trucks and mas’ players had cleared up, they stormed out of their gas-station encampment in full force, took over the avenue, and caught public and police by surprise as they made for pallbearers as unlikely as they did mas’ players Jamaican-style. “One step to the right, one step to the left,” shouted Patterson, flanked by two queered male nun characters. A reference to the Tivoli Gardens incursion, as it is locally known, the 2010 chasse à l’homme waged against drug lord Christopher “Dudus” Coke that left seventy-two dead, Invisible Presence: Bling Memories was also a commemoration of the year’s deceased, who initially were meant to be exacted in the number of coffins. The visual redundancy of carnivalesque and bling aesthetics brought together ensured visibility for the otherwise invisible lower classes Patterson sought to bring back from the “socially dead,” as Patterson’s namesake, fellow countryman Orlando Patterson, once called slaves. As she redressed the coffins and held them up as if protest placards—the performance participants standing right under them and standing in, as it were, for the newly, longtime, and future dead—she brought full circle a legacy of race and class relations that was indeed born of slavery in a surprising mood lifter for social depression inside and outside Carnival. A shot of the sky, the sight of a crane, then the vibrations of a trombone and a sousaphone a few feet apart against the background of the city’s industrial waterscape. “Setting the tone” was never so apt a phrase as when used to describe the opening traveling shot of Cauleen Smith’s H-E-L-L-O (Infra-Sound/Structure), a meandering elegy to New Orleans’s low sounds and bass lines, barely audible and hardly recorded sonic artifacts of last breaths and silent deaths. Each of the five notes played on baritone and bass saxophones, several sousaphones, a trombone, a contrabassoon, and a cello by musicians enlisted by Smith and sited at symbolic locations throughout the city—St. Augustine Church, Congo Square, Preservation Hall, and Tipitina’s—distilled a sense of loss as Smith’s moving camera recorded a panoramic landscape of residual poststorm emptitude. Yet the musicians’ tropism toward Smith, of their instruments to her camera, their sounds to her images, as some rotated to follow her following them even as she steered away from them, while others stood or sat still, looked straight back or closed their eyes, accrues over time to a kinesthetic recomposition akin to an invisible parade.32 By slowing down the processional motion of her camera and the rendition of the musician’s reduced score and synching them, she sophisticates visual representations associated with New Orleans’s public ceremonial culture with minute attention to its seemingly less appealing aspects. By making visible the filmic performance of music rather than the human performance to music, she doesn’t so much revert as avert the more obvious surrogative processes associated with moving bodies. She similarly motorized processional motion in Depth Procession, an attendant performance held partly in a party bus and partly on a ferry with invited guests bound on a round-trip from the Warehouse District to the west bank of the Mississippi River.33 Not your traditional second line, Depth Procession took steps toward a different kind of navigation, just as H-E-L-L-O played notes of a different kind of partition. It is not that the musicians in H-E-L-L-O and the participants in Depth Procession are not incarnated, but rather that those to whom the music is addressed have long departed or not yet arrived: they are, as the inaugural shot to the sky maybe alludes to, the extraterrestrial beings of Steven Spielberg’s Close Encounters of the Third Kind (1977), from which the score is borrowed.34 As she mined New Orleans’s ample memorial repertoire, Smith resorted to science fiction as she has done before and as the city itself often does—think Superdome, August 29, 2005—to prompt the performance of its future rather than its past, though of course Roach would argue that this is what performance does, for restoring behavior is making the futurity of the past tangible in the present. With H-E-L-L-O and BIG SUN, respectively, Smith and Christophe Chassol expand the mutually reinforcing performative qualities of music and film, using scoring and editing to make performance memorable. But where Smith slows down music and camera motion, Chassol creates such and other effects by cutting and repeating and otherwise intervening within the medium of the moving image itself. Throughout BIG SUN, Christophe Chassol’s hour-long film essay shot during the 2014 pre-Lenten Carnival season in and around Martinique’s capital city, Fort-de-France, Chassol, a Paris-based pianist and composer of Martinican descent, arranged robin songs, French Creole speech, dancehall-style spoken-word verses, marketplace conversations, carnival beats, and tonal music (Bela Bartók) he himself played on the piano as he would distinct sonic fragments, creating so-called ultrascores that underline the intrinsic musical qualities of manmade and natural sounds.35 Visual and sonic fragments in lockstep elaborate the narrative of a day from sunup to sunset and of carnival everydayness. BIG SUN features sites and protagonists related to each aspect of its audiovisual investigation: Martinican conteur extraordinaire Joby Bernabé, who delivers a carnival song-poem in French Creole in what seems like the lobby of a hotel with fading colonial imagery; famed Martinican band Malavoi member Pipo Gertrude, whistling birdsongs against the remembered sights of Saint-Pierre; and many other lesser-known or anonymous actors of Martinican culture. Carnival memory looms large over the entire film through evocations of Saint-Pierre, the former Petit Paris and Carnival capital of the Caribbean before the latter title was seized by Trinidad, in no small part due to steady migratory flows from Martinique to Trinidad since the 1783 Cedula of Population and up until the eruption of Mount Pelée in 1902, which destroyed Saint-Pierre.36 Unsurprisingly, the first verbal enunciation of the word Carnival and accompanying pelvis-gyrating movements occur at the marketplace—a carnivalesque site par excellence as per Bakhtin, circum-Atlantic behavioral vortex according to Roach—though by the unexpected figure of Madame Etienne Lise, an eighty-five-year-old market woman, who goes on to proudly enumerate her daily ballroom outings and boast about her carnival title of Reine des Mers du Sud (Queen of the South Seas). The film’s final segment, uncannily begun inside a car assailed by marauding monkeys against a mountain backdrop, surveys Fort-de-France’s carnivalscape until its seaside ending scene surrenders all its prior movements to the once intractable ebb and flow of the ocean from which it came. Marching bands reappear with snare and bass drums strapped to the bodies of their male and female players, women in various states of undress dare the camera with moves more coy than provocative, as in Trinidad or Jamaica, but still less so than those of an old lady—the marketplace woman?—wining to the front fender of a music truck. Monkeys, finally, make a show of strength with their ugly plastic masks, a reference to and, for Chassol, deliberate gesture of protest against racial slurs suffered by French Guyanan Christiane Taubira, the minister of justice of France. I do not recall the sound of the monkey sequence, nor care to rewatch the video to be reminded of it. Maybe no amount of sophisticated montage can replace silence in the face of outrage. On the Saturday of the Notting Hill Carnival weekend, drummers from the Batala London samba-reggae band, a Salvador de Bahia–styled batería (drum corps), hid under the Turbine Hall’s bridge to force audience members down from it and enlarge the “street”-level crowd, while another set of masqueraders, armed with shields and batons, attempted to corral the crowd through kettling maneuvers and sweep it out of the hall altogether. An exploration of the changing spatial politics of the Notting Hill neighborhood, Give and Take sought to critique the gentrification of a formerly predominantly Caribbean area that has become home to MPs and investment bankers, while embracing the Brazilian influence on the historically pan-Caribbean Notting Hill Carnival that has long been a façade for Britain’s fraught claims to multiculturalism. Wearing soft cardboard masks shaped like traditional Guianese devil masks and printed with photographs of the classic Caribbean peas and rice dish, the masqueraders cut rather genteel figures. Shifting from masqueraders to police officers as they turned their drumsticks into batons, did they manage to bring the performance’s intended message home, or did they provide instead, in the words of Christopher Cozier, “a tropical summer distraction between art seasons at Tate”?39 Give and take. Unlike Marlon Griffith and Ebony Patterson and, to some extent, Hew Locke, Nicolás Dumit Estévez and Charles Campbell chose to locate their projects at a relative spatial and/or temporal distance from Carnival: Estévez on the last Sunday of January, in the lead-up to the official Carnival parades, and Campbell on Easter Monday, on the day of, if not as part of, Kingston’s downtown Carnival. Portraits of performance participants singled out against a white photographic backdrop, and Estévez’s own portrait, subsequently taken by Santiago photographer Raymond Marrero, made for an interesting gallery in which performance codes were blurred. Did the cardboard sign around Estévez’s neck signal his status as a performance artist in its deliberate declamatory stance? Did the orange peels point to a local user and indicate a Carnival performer instead? Taken together, these portraits show an infinitesimal differential between the two through nearly imperceptible visual variants that translate an interstitial space of identification that can only resist fixation through performance. Video and photo documentation of Estévez’s C Room, as of Charles Campbell’s Actor Boy: Fractal Engagement, make the contrast between performance artist—or artist using performance—and performer more salient than do after-the-fact portraits such as the ones Estévez chose to stage, which Campbell eschewed altogether. A photograph by Marvin Bartley of Charles Campbell’s Actor Boy: Fractal Engagement showing a dark-skinned black man in a makeshift multicolor suit with a tattered briefcase, brown hat, and oversized black reading glasses for accessories next to a lighter-skinned man in simple white clothes and open sandals, his face concealed, encaged in a headpiece of soft, perforated cardboard, seemed to leave little doubt about who was the street performer and who the performance artist.43 Yet under the peculiar circumstances of the performance, the two were almost expected to shape-shift into one another—shape-shifting, after all, is what the twenty or so audience members underwent, as Campbell distributed similar masks, only blue instead of red, performing yet another reversal as gazers became gazed at and the neighborhood looked back. Uptown met downtown on downtown terms as uptowners were brought to make up for their class estrangement by being made to look and feel strange. Having been brought by bus ride from a safe location to an out-of-our-way neighborhood and given a guided tour of it, we became auto-tourists of sorts as we delighted in drinking coconut water as if a foreign delicacy at the first stop of a string of no-longer-seen local sights arranged for our visit. Fractal Engagement was Campbell’s latest iteration of Actor Boy, the historic nineteenth-century Jonkonnu figure of Belisario fame Campbell debuted in Jamaica in 2011, with public performances that quietly carnivalized space as they derailed daily routine with the quasi-normal yet disquieting presence of a character in a feathered headdress but otherwise unremarkable attire. In Kingston, Actor Boy’s guests ventured into the oft off-limits downtown territory of dons, thanks to the embassy of Jamaican artist, fashion designer, and music entrepreneur Kemar Black, following a sinuous network of alleyways where street performers lined up to play their tricks before entering into the disused upper room of a neighborhood bar. There, in a room that still bore burn marks from an arson incident several months before, between columns of coal around which shapes similar to the masks’ had been stapled, the audience stood, inert but for the spontaneous body ripples from the dancehall riffs down below—and the irrepressible drive to snap pictures and post on social media—while Actor Boy, now sans mask, arranged the performer apprentices on the eponymous fractals painted on the cement floor. As I recalled stapling cardboard triangles onto each other around the column and helping paint blue bands onto the floor days earlier with my cocurator, I watched Campbell draw white lines in broad brushstrokes, squinting until I could decipher a repeating pattern of flying birds. I wondered if this performance might be a countermemorial as the birds flew off from the fire. As Estévez did in a likewise vandalized room, Campbell transformed the space of the performance through reciprocal actions that upended time and suspended disbelief. Where C Room was a former museum room that was temporarily restored to its prior use by means of performance, Fractal Engagement’s upper room became a site for exhibition following the performance, as Black, his painter father, and others began to use it immediately after it had been vacated. The inside-outsiding and outside-insiding of Carnival and performance but also of Carnival, performance, and exhibitionary spaces is put into perspective in John Beadle’s Inside-Out, Outside-In. A contemporary artist and Junkanoo maker, the only artist to tackle that Bahamian Christmas masquerading tradition for EN MAS’ besides Campbell and, to a much lesser extent, O’Grady, Beadle constricted a Junkanoo costume inside a mobile apparatus meant for display and performance on Nassau’s Bay Street during the Junkanoo parades and in the space of the touring exhibition. 44Employing a process of fractalization at the scale of an entire costume, Beadle, like Campbell and Griffith, used unadorned cardboard to revert the space of visibility and place as its obverse not adorned material but raw matter. In conceiving of a performance space that, to paraphrase Beadle, was simultaneously the space and its exhibition, and for that space to be an inverted Junkanoo costume, Beadle sought to prevent representative associations in lieu of performative actions while making a performance of it. Beadle’s counterperformance in Nassau, which was initially scheduled to be first, ended up last, trespassing into the 2015 Caribbean season—and the Bahamas’ first Carnival, on May 7–9 of that year—and marking the chronological and geographical end of EN MAS’. Beadle’s boxed-in space is also reminiscent of another box and of a living being inside it, looking for a way out. 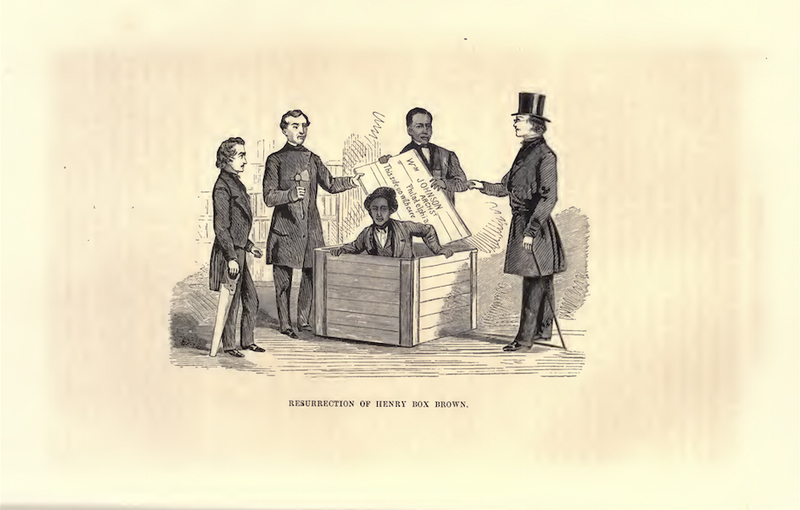 A performance of invisibility and, in the words of Adrienne Edwards, who suggests it might be “one of the earliest avant-garde performances of blackness,” “a virtuosic performance of stillness in motion,” I am referring here to Henry “Box” Brown’s disappearing act as he mailed himself to freedom in a wooden crate circa the mid-nineteenth century.45 As crates were being prepared to ship some of the material remnants of our year-round, looping, processional travels, I was made to wonder again about the meaning of Carnival and performance within the Atlantic oceanic intercultures of the Americas, when flesh can be bid farewell indeed, but only in a process of reverse transubstantiation into matter, object, or commodity. I finished writing this essay as I began to think about the materialization and spatialization of the exhibition in conversation with the artists and the exhibition designer, Gia Wolff. Cauleen Smith’s and Christophe Chassol’s films, the former seconds short of twelve minutes and the latter over one hour, would be featured as projections in self-contained screening rooms closed off by black velvet curtains. Nicolás Dumit Estévez and John Beadle planned to facilitate reperformances, the former in a makeshift closet that would provide intimacy for the exploration of one’s own “carnival self” and the latter by inviting the public to wear the smaller of the two costumes on display in the exhibition. Charles Campbell, on the other hand, recreated an installation in reference to but not illustrative of his performance. Marlon Griffith’s surveillance tower, destroyed over the course of his performance, was refabricated, and a selection of his costumes featured on mannequins in a way that, given their high design quality, eschewed ethnographic associations. 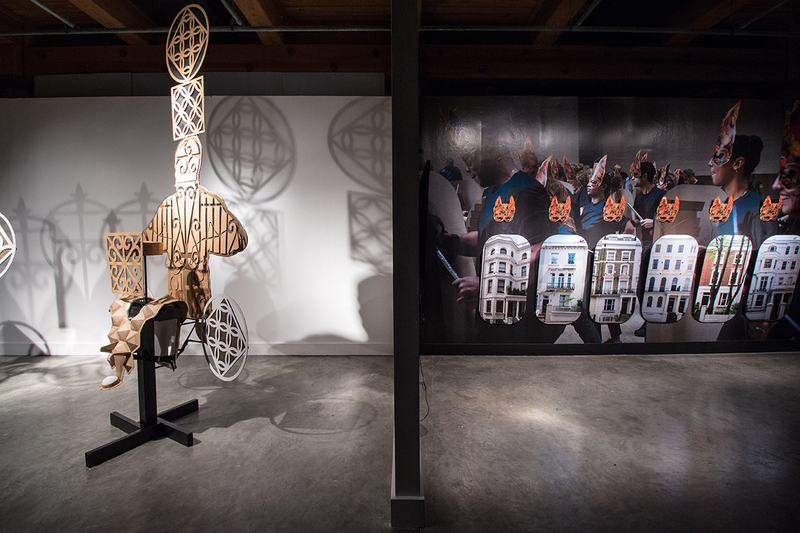 Drawing on yet another museological model, Hew Locke’s selection of printed cardboard shields and masks was displayed hanging on the wall like armors in a medieval museum. All but one of each, however, will be destroyed at the close of the exhibition tour, putting an end to his performance’s afterlife, in keeping with the old carnival fashion of throwing away one’s costume after the performance is over. Meanwhile, Lorraine O’Grady’s Looking for a Headdress displayed an interactive video pending the realization of the actual headdress for possible future performance as part of EN MAS’ on tour and elsewhere in what O’Grady referred to as a lifelong performance, there, too, anticipating her performance’s afterlife, as well as her own, putting the body, in its very incarnate fleshy matter, as its center. Lastly, Ebony Patterson’s coffins, the very resting place of bodies before flesh returns to earth, were put on sale by her gallery prior to the exhibition’s opening. In closing, the historical anteriority of African diasporic performance alluded to earlier is not my primary concern. My focus, then, is on the question of posterity and immateriality. How might Carnival be critically reinserted within the history of the exhibitionary complex? This at a time when the performance turn in artistic and curatorial experiments is cannibalizing even that which may have seemed unabsorbable—indeed, instrumentalizing that against which the very display apparatus of the modern museum was erected, and capitalizing upon the production of experiences that were meant to evade the commodification of object-based practices. Mario Benjamin’s project had to be cancelled for technical reasons. An artist working predominantly with painting as well as installation, he twice contributed floats to the carnival parades of Port-au-Prince in collaboration with the Grand Rue artists. John Beadle’s performance was likewise postponed for technical reasons. The Cuban artist collective Los Carpinteros, though not considered at the time of the elaboration of EN MAS’, would have been a good fit for it in light of Conga Irreversible, their reversed parade for the 2012 Havana Biennial. I am here referring to “participatory art” as defined by Claire Bishop in Artificial Hells: Participatory Art and the Politics of Spectatorship (London: Verso, 2012). Richard D. E. Burton, Afro-Creole: Power, Opposition, and Play in the Caribbean (Ithaca: Cornell University Press, 1997), 156. Milla Cozart Riggio, ed., Carnival: Culture in Action – The Trinidad Experience (New York: Routledge, 2004), i. See also Richard Schechner’s essay in the same volume, “Carnival (theory) after Bakhtin,” 5–11. Gerard Aching, Masking and Power: Carnival and Popular Culture in the Caribbean (Minneapolis: University of Minnesota Press, 2002), 18. This is a nod to John Cowley’s landmark book on the history of nineteenth-century Trinidad Carnival, Carnival, Canboulay and Calypso: Traditions in the Making (Cambridge: Cambridge University Press, 1996). See Peter Stallybrass and Allon White, The Politics and Poetics of Transgression (Ithaca: Cornell University Press, 1986). Brent Hayes Edwards, The Practice of Diaspora: Literature, Translation, and the Rise of Black Internationalism (Cambridge, MA: Harvard University Press, 2003), 14–15. Edwards conceives of the notion of diaspora as difference as a critique of Gilroy’s as “purity as invariant sameness,” 12. Hortense J. Spillers, “Mama’s Baby, Papa’s Maybe: An American Grammar Book,” Diacritics 17, no. 2 (Summer 1987): 67. Thanks to Krista Thompson for referring me to Spillers’s work. Joseph Roach, Cities of the Dead: Circum-Atlantic Performance (New York: Columbia University Press, 1996), 4. Paul Gilroy, The Black Atlantic: Modernity and Double Consciousness (Cambridge, MA: Harvard University Press, 1993), 17. “A unit of analysis for studying texts according to the ration and nature of the temporal and spatial categories represented. The chronotope is an optic for reading texts as xrays of the forces of work in the culture system from which they spring.” Mikhail Bakhtin, The Dialogical Imagination, ed. and trans. Michael Holquist (Austin: University of Texas Press, 1981), 426.
, likely from the maritime term crew, in New Orleans’s Mardi Gras. More generally, see the figure of the ship in historical African diasporic visual representations and performance practices, summarized in part in Krista Thompson’s essay in this volume. La Chavela Realty is described by El Museo del Barrio, where it is preserved, as “a site-specific performance held at the Brooklyn Academy of Music in conjunction with Guillermo Gómez-Peña's 1991: A Performance Chronicle, in which Fusco as Queen Isabella sold patrons deeds to the New World. 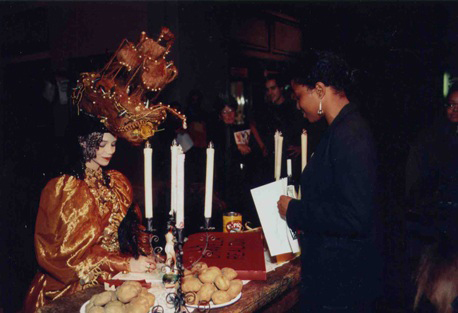 Costume designed by Pepón Osorio.” Fusco would later go on to write her influential essay “The Other History of Intercultural Performance,” which was first published in TDR/The Drama Review in 1994. I was surprised to find the following entry for mas in the New Oxford American Dictionary: “Mas: noun [ mass noun ] W. Indian carnival celebrations. [ as modifier ] : mas bands. ORIGIN abbreviation of masquerade.” Owing maybe to a French linguistic bias, I like to keep the apostrophe at the end—mas’—as a reminder of the word’s provenance. Mas’ is not, to my knowledge, used in the Spanish-speaking Caribbean. I discuss Carnival and performance in contemporary Caribbean art, and the role of mas’ in articulating it, in “Curating Carnival? Performance in Contemporary Caribbean Art,” in Curating in the Caribbean, ed. David A. Bailey, Alissandra Cummins, Axel Lapp, and Allison Thompson (Berlin: The Green Box, 2012), 37–62. A shift toward performance is also occurring in contemporary African art. Christopher Cozier quoted in Tancons, “Curating Carnival? 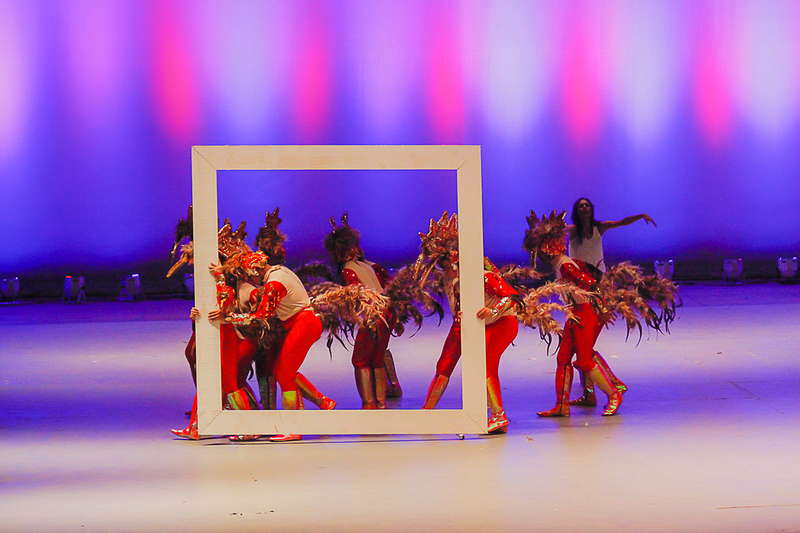 Performance in Contemporary Caribbean Art,” 49–50. Thanks to Krista Thompson for pointing out that Roadworks was the name of a Trinidad Carnival magazine in the 1990s. For historical elements about the Harlem Carnival and the West Indian American Day Carnival Parade in New York, and the St. Pancras Town Hall and Notting Hill carnivals in London, see Claire Tancons, “Occupy Wall Street: Carnival Against Capital? Carnivalesque as Protest Sensibility,” e-flux 30 (December 2011): 1–20, (Click here for the article), and Claire Tancons, curatorial statement for Up Hill Down Hall: An Indoor Carnival (exhibition shown at Tate Modern), August 2014, (Click here for the article) (see endnote 38 for further information). Recent scholarship shows that “The First Caribbean Carnival in London” was in fact held twelve years prior to Claudia Jones’s, on July 31, 1955, at the Royal Albert Hall and organized by Jamaican entrepreneur Hugh Scotland. See Ray Funk, “The First London Carnival was 1955!” upcoming article in the Trinidad Guardian. “African and Indian cultures are a driving force in a process of retro-colonization whereby practices, styles and beliefs from the former colonies are affecting the cultures of former colonial homelands.” Schechner, “Carnival (theory) after Bakhtin,” 7. Machel Montano, “Unconditional Love (Prelude),” from the album Winning Season, 2008. 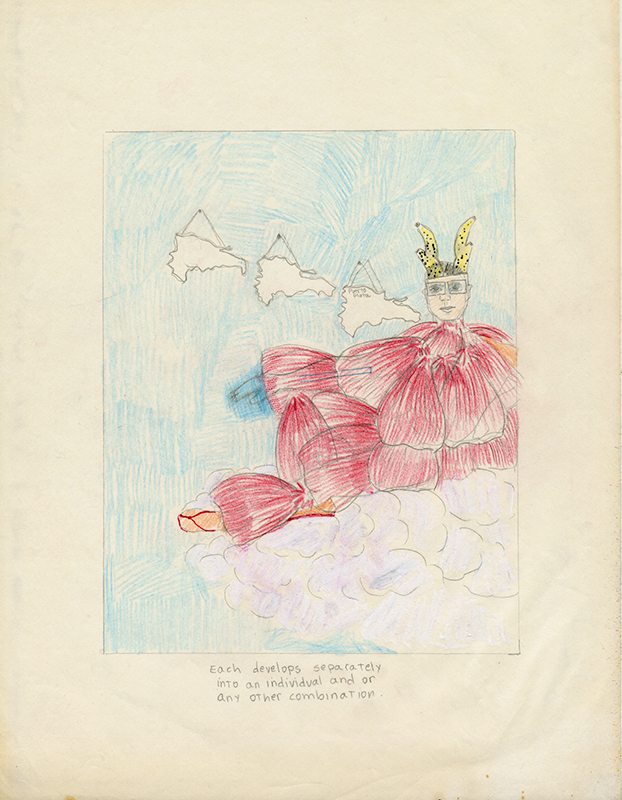 Lorraine O’Grady, “This Will Have Been: My 1980s,” Art Journal 17, no. 2 (Summer 2012): 6–17. O’Grady also recounted the anecdote to me when we first met in person on the occasion of the photographic presentation of Art Is…in Prospect.2 New Orleans, in 2011. Lorraine O’Grady, e-mail conversation with the author, December 20, 2013. Lorraine O’Grady, “Lorraine and Andil – email exchange before shooting (distilled),” one of various sections of Lorraine O’Grady’s project description, October 6, 2014. O’Grady, “Lorraine and Andil – email exchange before shooting (distilled),” October 6, 2014. Griffith, a mas’ man with a practice in kiddies bands (children carnival bands) and a visual artist trained as a graphic designer in Trinidad, slowly started to bring mas’ within his contemporary artistic practice. I found out about Griffith’s use of mas’ techniques in an installation he created for an exhibition I curated at Caribbean Contemporary Arts (CCA) in Port of Spain, Lighting the Shadow: Trinidad In and Out of Light (October 7–November 4, 2004). I later provided the curatorial context for the first performance expression of Griffith’s mas’ work with my first curated processional performance, SPRING, in 2008, for the 7th Gwangju Biennale, and have provided such context several times since. It is worth noting that, in the French West Indies, i.e., Guadeloupe, Martinique, and Guiana, the last day of Carnival is Ash Wednesday, during which masqueraders don black-and-white costumes and burn Vaval, a Carnival effigy and often times a likeness of the previous year’s popular scapegoat. While an artist-in-residence at Alice Yard, Port of Spain, in 2011, Patterson executed a rougher version of Invisible Presence. Called 9 of 219 and alluding directly to the Tivoli Gardens massacre, it included coffins held not vertically but horizontally. Cauleen Smith’s H-E-L-L-O (Infra-Sound/Structure) and Depth Procession: Go Low, Go Light were inspired by “Bass Lines: Deep Sounds and Soils,” in Rebecca Solnit and Rebecca Snedeker, Unfathomable City: A New Orleans Atlas (Berkeley and Los Angeles: University of California Press, 2013). Cauleen Smith, artist statement for H-E-L-L-O (Infra-Sound/Structure). I engaged Smith on the topic of public ceremonial culture in “Cauleen Smith and Claire Tancons in conversation about THE SUPERNOVA PROCESSION,” ISSUE Project Room (blog), May 30, 2012, (archived copy of original interview). Cauleen Smith’s Depth Procession: Go Low, Go Light assembled in front of Contemporary Arts Center New Orleans on June 7, 2014. In 2007, Smith shot The Fullness of Time, a sci-fi narrative that used Paul Chan’s Waiting For Godot (2007) as a starting point, which I presented in the exhibition City Stage at Contemporary Arts Center New Orleans (July 12–October 5, 2008). Chassol’s father was an amateur marching-band musician in Martinique. Chassol’s interest in brass bands first unfolded in New Orleans with Nola Chérie, an early fanfharmonized (a portmanteau of fanfare and harmonized, coined by Chassol) film with St. Augustine High School marching band and Rebirth Brass Band, among others, which I commissioned and exhibited in Score & Script: Music in Video at Contemporary Arts Center New Orleans (February 7–April 5, 2009). For the most comprehensive history of the Trinidad Carnival in the nineteenth century, see John Cowley, Carnival, Canboulay and Calypso: Traditions in the Making. For a detailed account and comparative history of nineteenth- and twentieth-century Trinidadian and Martinican masquerading practices in French Creole carnivals, see Claire Tancons, “Quand les cannes brûlaient: Danse des coupeuses de cannes à la Martinique, Canboulay à Trinidad” and “De récoltes en révoltes dans les carnavals caribéens de tradition créole française,” in Les Cahiers du Patrimoine 23 & 24, Le Carnaval: Sources, traditions, modernité (Conseil Régional de Martinique, 2007), 170–87. Claire Tancons, curatorial statement for Up Hill Down Hall: An Indoor Carnival (exhibition shown at Tate Modern), August 2014, (Click here for the article). See also endnote 38. Up Hill Down Hall: An Indoor Carnival was commissioned to me by Catherine Wood and Capucine Perrot, curators of the BMW Tate Live series. In response to their invitation to guest curate a carnival performance in the Turbine Hall on the weekend of the Notting Hill Carnival, I brought together architectural designer Gia Wolff, artists Marlon Griffith and Hew Locke, and Dubmorphology, as well as Central Saint Martins students and recent graduates, on Saturday, August 23, 2014. Only Give and Take, the performance by Locke, who had already been slated to intervene during the Notting Hill Carnival for EN MAS’, was a coproduction with CAC New Orleans. Tate Modern’s independent interest in Carnival signaled the art world’s growing interest in and appreciation for the importance of Carnival in the discourse and practice of performance. Christopher Cozier, e-mail conversation with the author, December 8, 2013. Cozier’s comment was aimed at Up Hill Down Hall as a whole but applies well to each of its constituent parts. Estévez, whose native city is reputed for its Carnival, has showed an interest in Carnival, alongside other queer rituals and processional forms, for decades. I first became aware of Estévez’s interest in Carnival in 2007, when I exhibited his drawings of never-realized carnival costumes in Mas’: From Process to Procession at BRIC’s Rotunda Gallery. In Nicolás Dumit Estévez, “El Almacen de los Olvidos Oferta Recuerdos al por Mayor,” unpublished paper, 2004, Estévez discusses the Museo Folklórico Don Tomás Morel’s horror vacui hanging style. Nicolás Dumit Estévez, e-mail conversation with the author, February 2, 2014. Charles Campbell, a multidisciplinary artist and curator of Jamaican descent based between Canada and Jamaica, started to activate Jonkonnu’s kinesthetic imagination and perform as Actor Boy in Jamaica in 2011. John Beadle, an artist and Junkanoo maker, the only other Carnival/Junkanoo practitioner in EN MAS’ besides Griffith, keeps a distance between his Junkanoo practice and his art practice, which, like Griffith’s, is influenced by techniques and materials from Junkanoo but never unfolds as Junkanoo-style processional performance, while his Junkanoo practice remains within fairly traditional boundaries of the genre, if at a level of artistic excellence. Note that in 2010, Griffith realized Stuffed Swan, a mas’-inspired performance, during Junkanoo. Adrienne Edwards, “I Am Not Here to Entertain You: Invaluable Performances of Blackness," conference paper delivered at Para Site International Conference 2014, Is the Living Body the Last Thing Left Alive? The new performance turn, its histories and its institutions, Hong Kong, April 3–5, 2014. Tony Bennett, “The Exhibitionary Complex,” New Formations no. 4 (Spring 1988): 73. The interior quoted material is Douglas Crimp, “On the museum’s ruins,” in Hal Foster, ed., The Anti-Aesthetic: Essays on Postmodern Culture (Seattle: Bay Press, 1983), 45. Tony Bennett, The Birth of the Museum: History, Theory, Politics (London: Routledge, 1995), 59. Emphasis is mine. The idea of being conscripted into modernity is David Scott’s, in his book Conscripts of Modernity: The Tragedy of Colonial Enlightenment (Durham: Duke University Press, 2004).